MASCOT Telecare, the service that monitors and responds to vulnerable residents living independently at home, celebrated its 25 year anniversary this week. At the celebration themed ‘then and now’, the service and special guests looked back at how the technology has advanced to provide customers with better tailored packages to keep them safe. Equipment from its launch in 1991 was on display at an exhibition in the Civic Centre as well as its new products available. 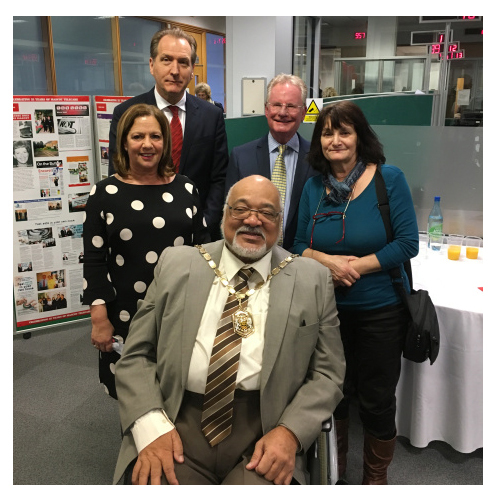 At the event, manager of the service, Suzette Simon welcomed special guests the Mayor of Merton, Councillor David Chung and the Leader, Councillor Stephen Alambritis who both said a few words. Director of UK Telehealthcare, Doug Miles closed the event. With over 1,600 customers MASCOT Telecare is continuing to offer life changing services that keep residents safe and give their relatives peace of mind. These include a movement detector that raises an alarm to the response centre if a customer is inactive for a long period of time. Smoke alarms are also installed, in line with The London Fire Brigade’s guidelines, to keep residents safer than ever.